The original version of this article was featured on Food Republic. A quick show of hands, if you will: Who loves lobster rolls? Chances are everyone without a shellfish allergy or vegan habits likely has one — possibly two — arms held high. Burgers and hot dogs certainly have their time and place, but bust out some lobster rolls at your next barbecue and you’ll be everyone’s best friend. What kind of lobster roll? The classic Maine-style — served chilled with a little mayo, a touch of lemon and sometimes something green (generally chives, scallions or celery) on a buttered split-top hot dog bun — is the standard bearer. But there are those that swear by Connecticut-style, served warm and mayo-less with a good soaking of drawn butter. Then there’s the experimental kind (which some consider heresy) that can include anything from the inclusion of wasabi to brown butter to pretzel or brioche buns. There’s no wrong choice, but you can easily choose poorly when it comes to the right wine pairing. Luckily, we’ve got some sommelier pals who say that Rueda Verdejo from Spain is the white wine you should be popping when those shells get cracking. You want a clean, crisp wine to let that sweet crustacean shine, which is exactly what you’ll get with Rueda wines. A summer favorite, and a classic New England tradition, The Capital Grille’s Lobster Roll is packed with sweet Maine lobster meat lightly tossed in a creamy dressing. Served on a rich buttery toasted brioche bun that complements the decadent flavor of the lobster, the dish offers elegant simplicity at its best. Although the lobster is the star of the show, the perfect wine match helps heighten the taste and the dining experience. The white wine I’d pair with it is Menade Verdejo from Rueda, Spain which offers crunchy mineral, dried green herbs and bright citrus fruit that enhance the flavors of the sea. The Menade Verdejo is from organically farmed old vines in the heart of Rueda, with lush, bright flavors that amplify the freshness of the lobster roll. Most people think steak when they think of Boston’s Grill 23 & Bar, but our seafood selection is one of the best in the city. Chef Brian Kevorkian’s take on a lobster roll doesn’t disappoint — the lemon aioli is outrageous. My favorite pairing with this is Naia’s Verdejo from Rueda. The ripe lemon and apple notes of the Naia highlight the sweetness of the lobster with plenty of acidity to cut through the richness of the aoli, and the herbaceous, grassy tones play beautifully off the tarragon. On a sunny day I love to walk along the Brooklyn waterfront through Brooklyn Bridge Park and stop in at ATRIUM Dumbo. We do an incredible roll with fresh lobster, tarragon, a touch of lemon juice and a slightly spicy horseradish mayonnaise. We finish it with a little Old Bay seasoning stuff it into a warm brioche bun! My favorite pairing with this lobster roll is Bodegas Angel Rodriguez “Martinsancho” Verdejo Rueda. It’s crisp and clean, fermented in enamel tanks and aged in very large neutral oak “cubas.” The resulting wine is generous, with delicious peach, melon and guava notes. 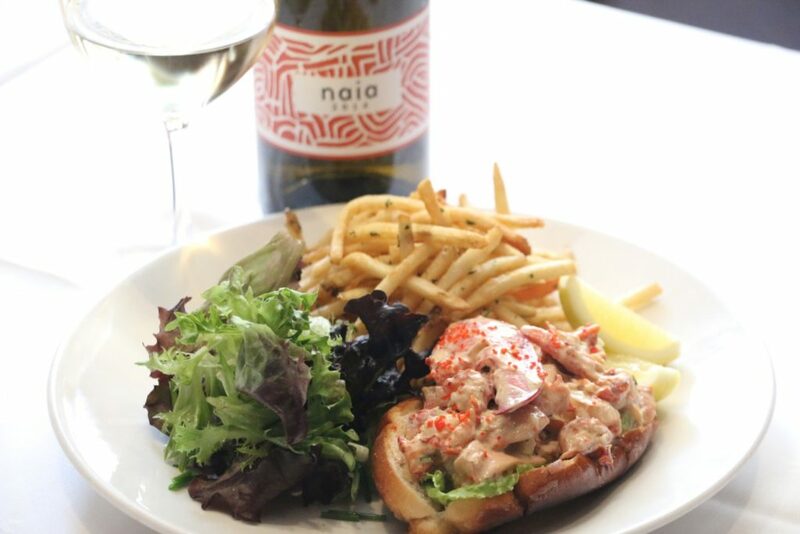 It’s textural, as well as mineral-focused and really complements the spice and saline nature of the lobster roll. Another one of my favorite lobster rolls is in Harlem. LoLo’s Seafood Shack has a take on the lobster roll with a Caribbean slant: It’s a sliced Johnny Cake (a cornmeal flatbread), stuffed with lobster, sliced avocado and a spicy remoulade. Its petite two-bite size makes it very easy to eat many, which is fine by me! The wine to pair with this would be a Carravinas Rueda Verdejo that is crisp and clean, but adds more of a tropical fruit touch to this Caribbean powerhouse. Notes of pineapple and papaya will pair well with the spicy remoulade. My favorite spot in the city for Lobster Rolls is Luke’s Lobster. I love the clean, lightly seasoned lobster on the warm, buttered roll. With this, one of my favorite wines to drink with it is the Vevi Rueda. This is an aromatic, textured, yet snappy and bright version of Verdejo that balances out the buttery roll and the freshness of the lobster itself. A big win — you can’t go wrong! I immediately thought of the Lobster Roll at Connie and Ted’s here in LA. We don’t really have a ton of crab shacks out here like on the East Coast but Connie and Ted’s is one of the only spots that compares. I love the lobster roll here. It comes on a warm brioche bun with drawn butter and lobster meat. It’s simple, but amazingly delicious. As for the perfect Verdejo pairing for this roll, it would have to be the Belondrade y Lurton Verdejo. This Verdejo is fermented and aged on its lees in French barrels, giving it tropical fruit notes and floral aromas. It has great acidity to match with the richness of the buttery lobster. The great thing about Verdejo from Rueda is that it can be quite versatile in the style it is made, but always with amazing acidity which can match up nicely with the fatty flavors in lobster rolls. When warm weather arrives, I love enjoying a glass of refreshing white wine on one of our restaurants’ patios. A current favorite is the Campo Alegre Verdejo from Rueda, Spain. This aromatic wine shines with fresh fruit notes of pear and white peach, floral nuances and a vibrant finish. Its grapes are grown on a small plot of land overlooking the Duero River. Spanish wine is a very hot category right now, and selections from Rueda are such gems, especially paired with seafood. I would match it with Legal Sea Foods’ famous lobster roll, bursting with meat from a whole lobster — tail, knuckle and claw. The tender, fresh lobster meat is complemented by a light lemon mayonnaise dressing and crisp celery and scallions, presented in a buttery toasted bun. The bright flavors of the wine balance nicely with the succulent lobster meat and herbaceous finishes. It’s the perfect pairing for summertime! For a lobster roll pairing, I’d go with a Reina De Castilla barrel-fermented Verdejo and a roll from Red Hook Lobster Pound. They have a food truck in DC, and whenever it’s in Metro Center, I hit it up for a Maine-style roll (lemon mayo, of course!) and then head to the sculpture garden. I’d pair it with the Reina De Castilla, a wine that sees some significant wood, which creates a full-bodied and creamy wine. The sweetness of the lobster and the richness of the mayonnaise need the weight this Verdejo has. The bright acidity cuts through the richness, helping your palate reset with each bite.